02.09.2019 - As John Mellencamp's Riverside Theater show approached its conclusion Friday, the Heartland rocker suggested he wasn't very nostalgic. That was a curious thing to say following an hour-and-50 minute set heavy on classics and crowdpleasers — performed by a seven-piece band in attire inspired by early 20th-century vaudeville. The "weathered" Mellencamp logo on the drum kit looked like it came from Preservation Hall in New Orleans, and before Mellencamp came to the stage, the packed house watched a 20-minute documentary looking back on his life and career (complete with "American Bandstand" footage). Yet for all the evidence that would seem to suggest Mellencamp indeed is a very nostalgic guy, his Milwaukee concert Friday also supported his statement. Yes, these were largely older songs, but Mellencamp didn't play 'em like they were. He performed everything with vigor and meaning. He played 'em like they still mattered. "The John Mellencamp Show" tour, which kicked off Thursday night in his home state of Indiana, is technically in support of a covers album from December. Not exactly the most enticing project fans would want from a veteran singer-songwriter, and Mellencamp didn't help matters by naming the album "Other People's Stuff." But his passion even for "other people's stuff" was inspired Friday when he covered album track "Stones in My Passway." As Andy York played a sizzling slide guitar, Mellencamp stomped his foot and belted out Robert Johnson's tune with the passion of a preacher, and the enthralling snarl of a lifelong sinner. The occasional wear of his voice — reminiscent in flashes of Tom Waits — also added character to some of his songs, like "Longest Days." 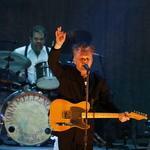 "So you tell yourself that I'll be back there on top someday," Mellencamp sang Friday. "But you know there's nothing waiting for you up there anyway." His torn voice in Milwaukee conveyed the hopelessness of that sentiment more effectively than it could in the studio 11 years ago. Mellencamp also brought new energy to signature "Jack and Diane," which he performed alone with an acoustic guitar Friday. The crowd boisterously sang along like the full rock band was swinging, but Mellencamp's simple approach offered sweeter support for the tale of two Heartland kids "suckin' on chili dogs outside the Tastee-Freez." And in the middle of a breathless five-song run of hits near the end — including "Rain on the Scarecrow," "Paper in Fire," "Crumblin' Down" and "Pink Houses" — Mellencamp's "Authority Song" in particular took on a renegade spirit, with Dane Clark's explosive drumming, and Miriam Sturm's fierce fiddle work between jubilant dancing once the song briefly segued into a dynamite take of Wilson Pickett's "Land of 1000 Dances." In addition to the older stuff and other people's stuff, there was some new stuff, too, from 2017's "Sad Clowns & Hillbillies" — including a powerful political ballad, "Easy Target," inspired in part by the Black Lives Matter movement, that ended with Mellencamp taking a knee on stage Friday. "Crosses burning, such a long time ago," he sang. "400 years and we still don't let it go." To tweak a line from "Jack and Diane," it was clear to see Friday that for Mellencamp, the thrill of living isn't gone — not when there are still injustices in the world, and important songs left to make. Early in the night, Mellencamp got some strong laughs and cheers when he asked the (expletives) in the crowd who liked to yell to step into the lobby during the night's quiet moments. The request was obliged — for the most part — but near the show's end Mellencamp had an awkward, shouted exchange with a fan on the floor, which ended when he suggested to the woman's date that she had been overserved. There were a couple funny family stories, too. Mellencamp talked about a time when he sat down with his kids and started talking about his past when his son, 9 or 10 at the time, boldly proclaimed that none of them cared and walked out of the room. Mellencamp also recalled lying with his bedridden grandmother as she passionately prayed that she and her grandson were "ready to come home." She lived to be 100, he said, but is still with him as his guardian angel. If you missed out on Mellencamp Friday or just want to experience the show again, he'll be at the Weidner Center for the Performing Arts in Green Bay on April 13. 5. "Stones In My Passway"
6. "We Are The People"
14. "Rain on the Scarecrow"